A large number of women were among the teachers and retired Education Ministry staff who had converged from around the country outside the Education Ministry in Tehran, on Sunday, May 13, 2018. They demanded their bonuses and rewards after 30 years of service. 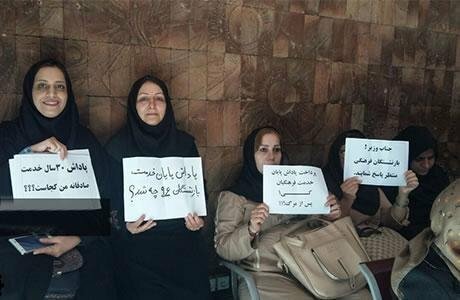 On the same day, the laid-off employees of the IRGC-backed Caspian Institute in Mashhad, including a number of women, gathered in protest outside the General Department of Labor and Social Welfare in Khorassan Razavi Province. At the same time, young women and men studying at Qouchan Industrial University staged a protest in front of the university’s administration building on Sunday, May 13, 2018, to protest to the status of educational years. A similar protest was held the day before in Mashhad’s Ferdowsi University which has a common Board of Trustees with Qouchan Industrial University.